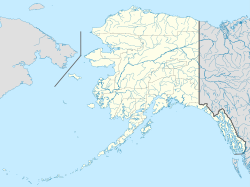 Aiktak Island (Aleut: Ugangax) is one of the Krenitzin Islands, a subgroup of the Fox Islands in the eastern Aleutian Islands in the U.S. state of Alaska. It is 1.3 miles (2.1 km) long and is located 38 miles (61 km) east of Akutan Island. Aiktak is an Aleut name transcribed by Captain Tebenkov in 1852 as "Ostrov Aikhtak." R. H. Geoghegan suggested that the name is derived from the Aleut "aikhag", meaning "travel or going on a voyage." It is also known as Ashmiak. ^ U.S. Coast and Geodetic Survey (1900). Bulletin. 36-41 (Public domain ed.). U.S. Government Printing Office. pp. 175–. This article about a location in the Aleutians East Borough, Alaska is a stub. You can help Wikipedia by expanding it. This page was last edited on 19 February 2016, at 19:23 (UTC).